Large & Highly Decorative, Antique Victorian, Sterling Silver, Centerpiece Made By Horace Woodward & Co, London 1894. The embossed plateau of bold scrolling shell and foliate ground around two central cartouches, one engraved with presentation inscription, supporting three detachable oval baskets; one large and two small, embossed in a similar manner to the plateau around the Cork city arms. 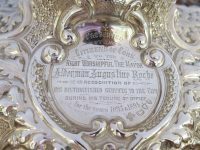 The presentation was to Mayor Augustine Roche for his service of 1893 & 1894. 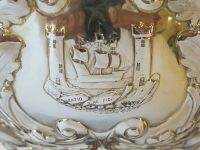 The Cork coat of arms showing a ship between two towers, with the Motto of Cork City: 'Statio Bene Fide Carinis' These Latin words mean a 'safe harbour for ships'. The firm of Horace Woodward was originally established in Birmingham c. 1850 by George Cartwright and Joseph Hirons, trading as Cartwright & Hirons. In 1853, when Horace Woodward entered in the partnership, the firm changed to Cartwright, Hirons & Woodward. The firm was active as silversmiths at 138/139 Great Charles Street, Birmingham, and London showrooms at 41 Hatton Garden, London. In 1859 Joseph Hirons left the partnership and the firm changed its name to Cartwright & Woodward. In 1865, after George Cartwright's retirement, the business was continued by Horace Woodward under the name Horace Woodward & Co. In 1883 Horace Woodward left the company and the business was continued by Edgar Finley and Hugh Taylor, maintaining the same name until 1893 when the firm was converted into a limited liability company as Horace Woodward & Co Ltd. In the same year the production was transferred to Atlas Works, Paradise Street, Birmingham and additional premised were opened in 1903 at Vyse Street, Birmingham. In 1919 the firm was acquired by Adie Brothers Ltd. The firm participated with great success in the London Exhibitions of 1851 & 1862, Paris Exhibition of 1867 and Melbourne Exhibition of 1881.